Worship @ Eastmonte Park this Sunday, February 10! NO Family Bible Time this Sunday, Feb. 10! This past Sunday as we took a closer look at the account of Jesus healing Peter's mother-in-law and others who were hurting in the town of Capernaum, we found God healing us. The following devotion is adapted from Sunday's sermon on Luke 4:38-44. If you would like to read the sermon in full, simply click on Where in the World Is God? Healing You. What is it that ails you? What is it that leaves you broken? Perhaps it’s a guilty conscience for the foolish sins of your past or the loveless sins of your present. Perhaps it’s grief or worry for a loved one. Perhaps you’re plagued by fears of what the future might hold or uncertainty over your finances or your family or your job or your marriage or your relationships. Perhaps sins of weakness leave you suffering each day. Perhaps physical or mental ailments leave you feeling spiritually broken as they draw you away from Jesus. Every one of us is ailing and broken in some way, whether we admit it or not—and we can’t possibly help ourselves. We need the Great Physician and his compassionate care. We all desperately need Jesus to heal us. Sometimes God allows suffering and sorrow into your life to drive you to Jesus. In his grace and mercy, Jesus doesn’t look down on you. Jesus understands your brokenness and mine. So he provides healing for every single one of us. With free and full forgiveness earned not by us, but for us on the cross, Jesus heals you of the guilt of your sins. Jesus heals you of grief and worry, uncertainty and fear with the healing medicine of life eternal, hope, and certainty through Spirit-created faith in him. With the scalpel of his Law, Jesus removes your weakness and doubt and unbelief, but with the salve of his Gospel, Jesus heals you. Through his Word, he breathes life into your dead soul. He opens your eyes to see the forgiveness he secured. He gives sight to your blindness with the light of his love. He reconciles you to God and unites you as members of one faith in his Holy Supper. Yet how do you and I usually respond to Jesus’ healing? Doesn’t it often happen that we’re grateful and we give thanks when Jesus provides help, but we often limit our response to mere words or thoughts of thanks? As people healed by the Great Physician, we can do so much more! Now Jesus doesn’t expect you to do something extraordinary. No, he calls you to faithfully carry out your God-given calling to your neighbor. That begs the question—“Who is my neighbor?” Your neighbor isn’t just the couple who lives next door or the family across the street. Your “neighbor” is that person whom God puts in your path to serve whether that’s at home, here at church, at work, at school, or out in your neighborhood. God has given each of us unique callings to serve God through faithful service to our neighbors. That’s how Peter’s mother-in-law responded to Jesus’ healing. We don’t faithfully serve so we can earn God’s favor or even make up for a single sin. If that were the case, then you might as well pull Christ down from the cross and take your sins back on yourself. No, we’re motivated by Christ’s love for us to live lives of faithful service. “For Christ’s love compels us, because we are convinced that one died for all, and therefore all died. And he died for all, that those who live should no longer live for themselves but for him who died for them and was raised again.” (2 Corinthians 5:14-15) Jesus has healed us—body and soul. So we don’t go back to our old habits and old brokenness. Instead, we faithfully serve Jesus because we realize how uniquely he has healed each of us. The Church Picnic is planned for this Sunday, February 10 @ Eastmonte Park, Cal Ripken Pavilion (830 Magnolia Drive, Altamonte Springs). Worship begins at 10 am with a potluck lunch and games to follow. Please note that there will be NO Family Bible Time @ 9 am. We hope you can join us this Sunday! 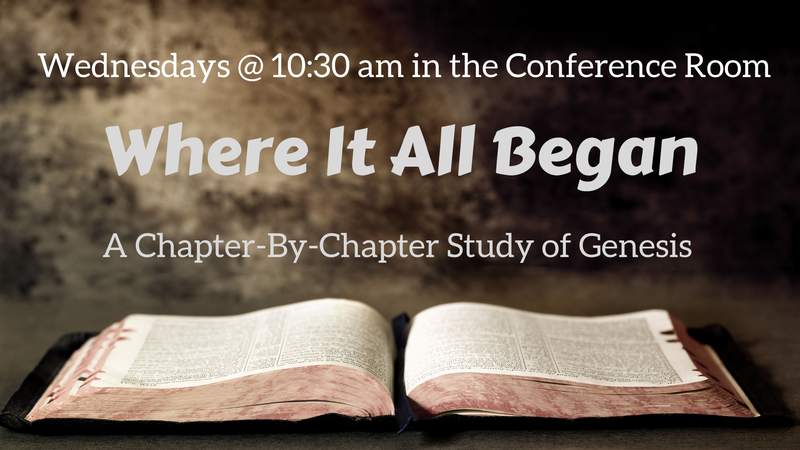 Where It All Began – Join us Wednesdays @ 10:30 am as we continue our chapter-by-chapter study of the book of Genesis! Even if you haven’t joined us for this study yet, we would love to have you join us in the Conference Room this Wednesday! Funday Sunday #3 is planned for Sunday, February 24. It will be a busy day full of fun activity as we focus on God's love for us! The kids will sing during worship @ 10 am. Afterwards, our KoK Science Fair will take place in the gym, while our Kindergarten Round-Up will take place in the lower grade classroom. Oh, and one more important detail! We will also have a Pig Roast prepared by our members! If you would like to bring a side for the meal, please contact the church office! Career Day Assistance – On Wednesday, April 10 from 8:30-10 am, we are planning a career day for our King of Kings students. If you would be interested in talking to our students about your career, please contact Randy Cochran ASAP! It would involve presenting four 15-minute presentations with a 15-minute break between each presentation. Vietnam-Hmong Outreach - The Light of the World is presenting amazing opportunities to our church body to take the gospel into Vietnam. Informational booklets can be found in the entryway. So far, $500.000 has been raised towards these efforts. That’s about 25% of what is needed. How awesome it is to see God for opening doors and opening hearts! If you would like to donate towards these mission efforts, please use the envelopes in the booklets or donate online @ WELS.net/Serving-Others/Missions/Asia/Vietnam. Property Leads? – Pr. Dan Wagenknecht, former King of Kings vicar (1992-93), is planning to move to the Greater Orlando area after accepting a Call to serve as a WELS Christian Giving Counselor. If you have any leads on rentals or properties, please reply to this e-mail or speak with Pastor!